This guest post was promoted from the Forums. More information on Guest Post Promotion here. Literary Agency will not be inviting you to join our client roster. of enquiry (in this case, myself). A little extra effort would have gone a long way, believe me. for ‘will you read my book?’ of course you want us to read your work. enquiry is redundant, to ask twice, as you did, smacks of desperation. your current need for employment. It makes you sound desperate. Your covering letter tells me next to nothing about the novel you’d like us to represent, not even (and this is an enormous faux pas) its title . you) harbors an ambition to write paperbacks. It’s too vague. Give me a reason to care. Give me a reason to ask for more. it into two, or even three, novels. I’m afraid that’s not possible. I sincerely hope you find my comments and observations helpful. Wishing you the very best in your future endeavors. Born in England, Jon Gibbs (www.acatofninetales.com) now lives in New Jersey, where he’s a member of SCBWI, The Liberty States Fiction Writers and Garden State Horror Writers. He’s the founder of The New Jersey Authors’ Network and FindAWritingGroup.com. Jon’s debut novel, Fur-Face (Echelon Press 2010), a middle grade science/horror/fantasy for boys aged 10-12, was nominated for a Crystal Kite Award. His popular blog, An Englishman in New Jersey (http://jongibbs.livejournal.com), is read in over thirty countries. Jon can usually be found hunched over the computer in his basement office. One day he hopes to figure out how to switch it on. Funny! I've thought about that song in that light ever since I started working on query letters. Awesome!This was a really clever post! However, it does absolutely prove my point that query letters are a terrible, inaccurate way to screen writers and should go the way of the Dodo bird. Anyone who turned down Paul McCartney's query would have lived to deeply, deeply regret it. Also, thanks for posting the lyrics, Steve. I totally didn't catch the "son/Sun" reference until just now. Isn't it far more likely that the agent just wouldn't respond at all? Hilarious! Thanks for the laugh! It took me years to figure out that the backing vocals are singing the old French children's song "Frere Jacques". Fun post! I never paid close attention to the lyrics before — puts them in a whole new light. I'll be humming this tune all day. Two years ago for Christmas, my wife bought me "A Hard Days Write" The stories behind every Beatles song. Great book! Paul had been challenged by one of his Aunts to write a song that wasn't about love. He looked around and Ringo was reading a book. he said, "I'm gonna write a song about a book. Much of the lryic was taken directly from a letter that Paul received from a fan/aspireing novelist. The man named Lear, was probably Edward Lear, a painter and poet that John liked to read. Like most of their songs the lyrics are driven by the sound of the words, and not the logic of them. "Literally, it's about a writer who has composed a book based on novel about a paperback writer. In other words, it's a novel based on a novel about a man writing a novel-which in turn presumably based on a novel about a man writing a novel." And that's nothing short of brilliant. Brilliant piece of writing by Paul, brilliant song, one of my favorites since I was old enough to walk. This cracked me up! The Beatles used a lot of nonsense lyrics, so no surprise there's vagueness and cliches here. Big no-nos for queries! 1) I would read the heck out of DRACULA VS. THE DALEKS. 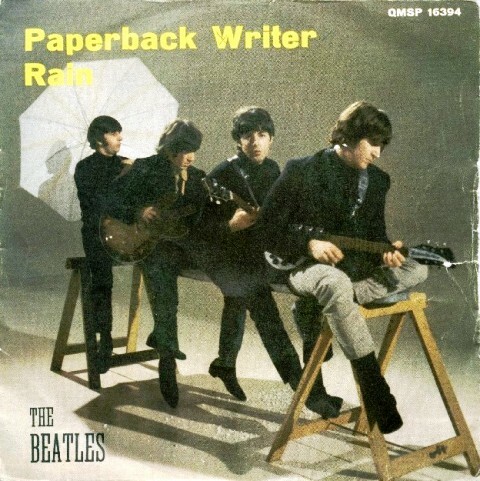 2) "Paperback Writer", as silly as it is, is going to be my jam when it comes time for me to query. 3) The cat on your cover looks like mine and therefore I am intrigued, though I am not a 10- to 12-year-old boy. Seriously, though, very entertaining post. Years ago my husband worked for Mercury House in San Francisco, and they actually received the lyrics of this song typed out (yes, typed—it was a long time ago) in query letter form. They figured it was a prank pulled by a friend of someone who worked there, but it made for a fun day at work. OMG. Jon. You are famous.. great blog post about rejection letters. Most of mine have been rather impersonal but polite. That one is a hoot. Well, I, for one, am most certainly entertained by this post. Again, thank you everyone for the kind words. As Mr. D. said in his comment, it's a great song. I had a lot of fun writing about it. That was genuinely funny! Next, the elevator pitch from Sympathy for the Devil? Treating the song like a serious query was seriously funny! And educational. Looking forward to someone taking on the Sympathy for the Devil critique.